78 year old presents with 20/200 vision in the right eye. OCT of the macula is shown. 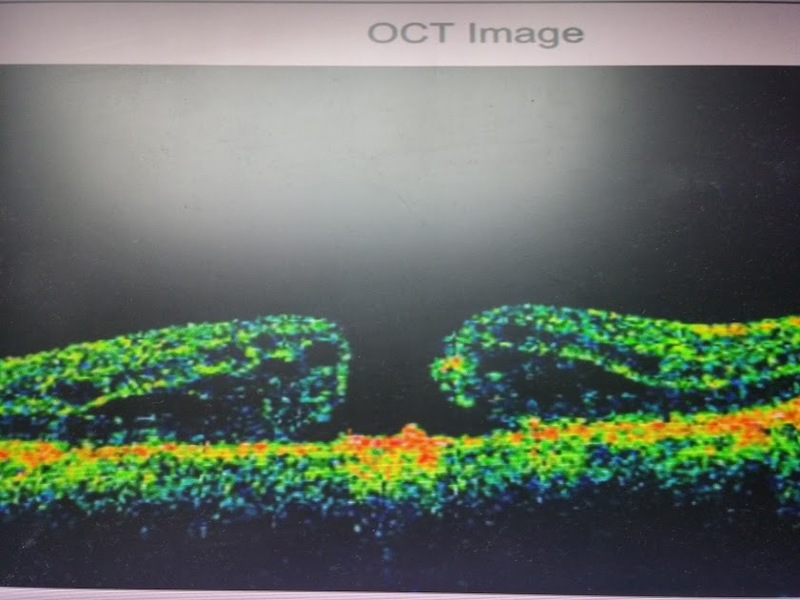 OCT of the left eye suggest normal retina with vitreomacular separation and 20/20 vision. What is the risk of this patient loosing vision in the left eye? Idiopathic macular holes are caused by the tractional forces associated with perifoveal vitreous detachment, an early stage of age related posterior vitreous detachment (PVD). Left eye has minimal if any risk of developing macular hole since the vitreomacular separation. Satge 1: Loss of central vision loss (2025-20/60), metamorphopsia. Stage 1A: Yellow spot in fovea (OCT with psuedocyst or schisis with PVD from perifoveal retina but not from foveal center. Stage 1B: Yellow ring in fovea (OCT with break in outer foveal layer). 50% resolve spontaneously with complete PVD and resolution of vitreomacular traction. Satge 2: Tractional break in the inner layer of pseudocyst with the opening in the inner layer < 400 microns. Stage 3: 20/200 vision. Fully developed Hole >400micron diameter with posterior hyaloid detached from fovea but still attached to optic disc. ...for cutting-edge medical education and training, accessible anywhere, anytime, on your computer, tablet or mobile device!